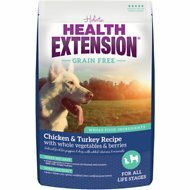 Health Extension Pet Care makes dry and canned dog food, cat food, dog treats, vitamins and supplements, dog shampoos and conditioners, and other pet products. The company was formerly known as Vets Choice but changed the name in 2015. They have been in business since the 1960s and have been family-owned for three generations. 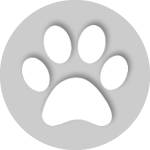 The company is a recipient of the 2016 Pet Business Industry Recognition Award. They are a member of the Pet Sustainability Coalition and their foods have been endorsed by the American Canine Association. 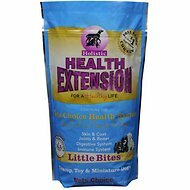 Health Extension dog food recipes are free of artificial colors, flavors, and preservatives. No BHA or BHT, added sugar, or ethoxyquin. The company has headquarters in Deer Park, Long Island, New York. 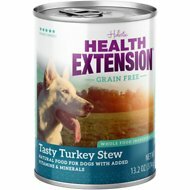 Who Manufactures Health Extension Dog Food? 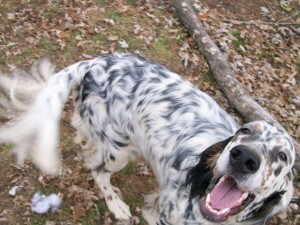 According to Petfoodindustry.com, Health Extension’s foods are made in two facilities in New York and New Jersey. The New York facility at Deer Park may make their dry foods. Simmons has a cannery in New Jersey but there may be other pet food canneries in the state so that’s only a guess. 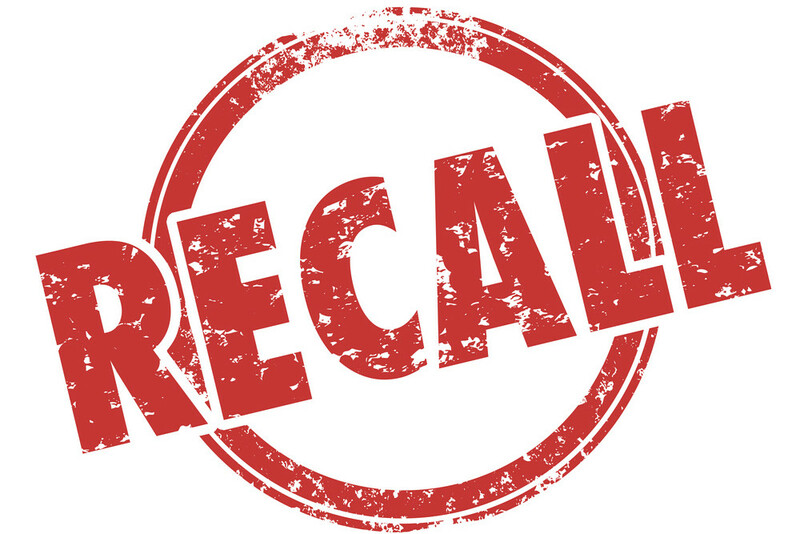 According to the company web site, Health Extension has never had a recall. 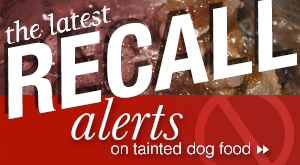 We did not find any recalls for Health Extension or for Vets Choice online. Health Extension’s products are advertised as “holistic.” All of their dog foods contain Fish Oil, Primrose Oil, Glucosamine, Chondroitin, Colostrum, Blue Green Algae, Prebiotics, and Probioitcs. Organic chicken is now the number one ingredient in their dog foods. They never use by-products, gluten, wheat, corn, soy, or any artificial flavors, colors, or preservatives. 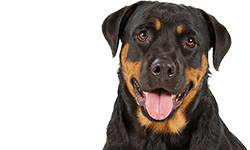 Per the company web site, every Health Extension diet is formulated to meet the nutritional levels of the AAFCO Dog Food Nutritional standards for all stages of a dog’s life. According to Health Extension, their feeding their foods helps produce stronger bones and immune system, healthier skin and coat, better hearing and eyesight, healthier organs, more energy, and greater stamina. 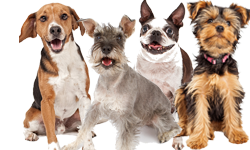 Of course, all pet foods make big claims for their foods but we are always optimistic when we look at dog foods and their claims. 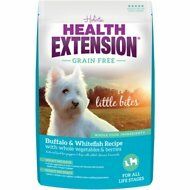 Health Extension currently makes twelve dry kibble formulas, with a 13th on the way. (Note that the company is updating their package designs for some of their original formulas. You can see what the new packaging will look like here.) The company makes ten different canned foods for dogs. Specifically created for the teacup, toy and miniature breed puppy and adult dog. Completely balanced diet containing highly digestible meat proteins. Hypoallergenic formula specially prepared with all-natural ingredients for the complete health of your dog. With New Zealand free range deboned Lamb as the number one ingredient. Also available in the smaller kibble Lamb and Rice Little Bites. Hypoallergenic formula specially prepared with all-natural ingredients for the complete health of your dog. With New Zealand free range deboned Lamb as the number one ingredient. 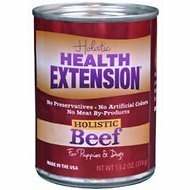 This is the same formula as Health Extension Lamb & Rice Dog food only made with small bites for small dogs. Nutritionally formulated to meet the needs of overweight, spayed, neutered, and senior dogs. Reduced fat formula with 50 percent less fat than Health Extension Original formula. Nutritionally formulated to meet the needs of overweight, spayed, neutered, and senior dogs. Reduced fat formula with 50 percent less fat than Health Extension Original formula. 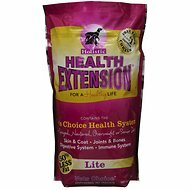 This is the same formula as Health Extension Lite dog food made with bite-sized pieces for small dogs. Grain free, no added hormones. Organic chicken is the first ingredient. Recommended for dogs with allergies or sensitive digestion. Health Extension Grain Free is formulated to meet the nutritional levels established by the Association of American Feed Control Officials (AAFCO) Dog Food Nutrient Profiles for all life stages. Grain free with no added hormones. Deboned buffalo is the first ingredient. Recommended for dogs with allergies to poultry or sensitive digestion. 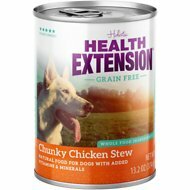 Health Extension Grain Free is formulated to meet the nutritional levels established by the Association of American Feed Control Officials (AAFCO) Dog Food Nutrient Profiles for growth of puppies and maintenance of adult dogs. Grain free with no added hormones. Deboned buffalo is the first ingredient. Recommended for dogs with allergies to poultry or sensitive digestion. This is the same formula as Grain Free Buffalo and Whitefish but with small kibble pieces for puppies and small breeds. Grain free with no added hormones. Deboned venison is the first ingredient. Recommended for dogs with poultry allergies and sensitive digestion. 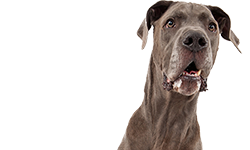 This diet is formulated to meet the nutritional levels established by the AAFCO Dog Food Nutritional Program for all stages of a dog’s life, including growth of large size dogs (70 lbs. or more as an adult). Grain free without any added hormones. Deboned salmon is the first ingredient. Recommended for dogs with poultry allergies and sensitive digestion. Grain free without any added hormones. Deboned duck is the first ingredient. 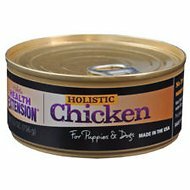 Recommended for dogs with chicken allergies and sensitive digestion. Chicken and Brown Rice Large Bites coming soon, per the Health Extension web site. As you can see, all of the Health Extension kibbles have named meat protein as the first ingredient. In some cases they have meat protein as the first two or even three ingredients. Many of the foods use organic meat proteins which will please many dog lovers. All of their meats come from the United States with the exception of lamb which is raised in New Zealand. The protein levels in the foods are moderate (Health Extension describes them as “sensible”). Crude protein levels in the foods range from 24 to 27 percent. 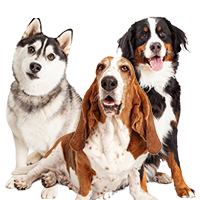 With the exception of their lite dog food (9 percent fat per the guaranteed analysis), the foods have crude fat percentages between 14 and 18 percent which is moderate for most premium dog foods. Crude minimum fiber percentages vary between 4-5 percent. Now let’s take a look at the Health Extension canned foods. Grain free, made with all-natural beef. No growth hormones, steroids, meat by-products or allergy-related fillers. Grain free, made with all-natural chicken. No growth hormones, steroids, meat by-products, or allergy-related fillers. Grain free, made with all-natural turkey. No growth hormones, steroids, meat by-products, or allergy-related fillers. Grain free, American-made, all-natural. A way to add more protein to your dog’s diet. 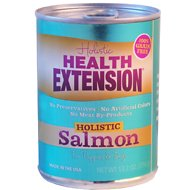 Holistic Health Extension Salmon for Puppies & Dogs is meant for supplemental feeding. Meaty Mix Beef contains over 95 percent all-natural, super premium real beef. This product is intended for supplemental feeding only. Grain free. Made with real turkey and chicken. No growth hormones or steroids. 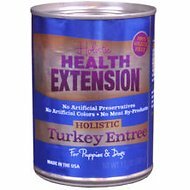 Holistic Health Extension Turkey Entree is formulated to meet nutritional levels established by the AAFCO dog food nutrient profiles for growth and maintenance. Grain free. Made with all-natural duck. No growth hormones, steroids, meat by-productts, or allergy-related fillers. Meaty Mix Beef contains over 98 percent all-natural, super premium deboned chicken. Made with lamb from New Zealand. No growth hormones or steroids. Lamb is often a good choice for dogs that need a high quality meat protein but which have allergies to other common proteins. 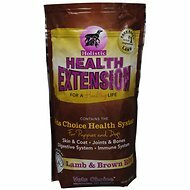 Vets Choice Holistic Health Extension Lamb Entree is formulated to meet nutritional levels established by the AAFCO dog food nutrient profiles for growth of puppies and maintenance of adult dogs. No meat proteins. (Does contain dried eggs.) Specially formulated for dogs with food sensitivities. 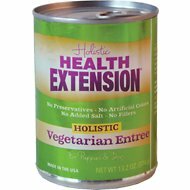 Vets Choice Holistic Health Extension Vegetarian Entree is formulated to meet nutritional levels established by the AAFCO dog food nutrient profiles for growth and maintenance. We genuinely appreciate the fact that Health Extension provides such precise information on their web site about their foods. For example, not only do they provide AAFCO statements, but they also indicate that their 95 percent canned foods are for supplemental feeding only. 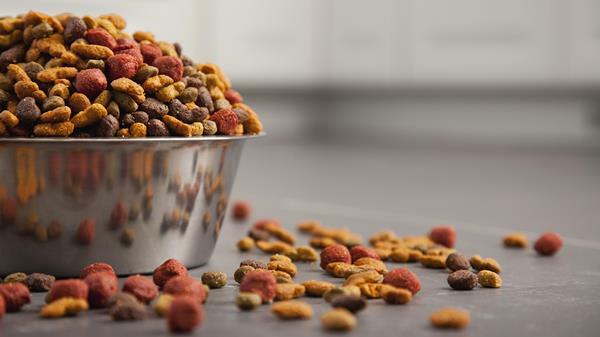 Many dog food companies do not do this which causes confusion for some dog lovers about whether or not they can feed the food as a complete meal. Kudos to Health Extension for providing this information, along with calorie information and some other info we love to see but don’t always find on pet food web sites. 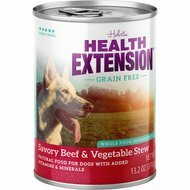 As you can see from looking at Health Extension’s canned foods, they have a wide variety of stews, entrees, and meats for supplementing your dog’s diet. Many of the foods have meat as the first ingredient, with the exception of the vegetarian canned food; and the stews which have broth as the first ingredient. Crude protein percentage for the canned foods (with the exception of the 95 percent meat foods) is 8-10 percent. The 95 percent meat foods have crude protein percentages ranging from 10-12 percent. The vegetarian food has 7 percent crude protein. Fat percentages for most of the canned foods range from 4.5 to 6 percent crude fat. The 95 percent meat foods have fat percentages ranging from 6-8 percent. The vegetarian food has 2 percent crude fat. Leaving aside the vegetarian food, these percentages are comparable to other good quality canned super premium dog foods and higher than some. Just a word about the vegetarian entree for dogs. While we appreciate the fact that some dogs may need a vegetarian food if they have problems eating meat proteins, we do not recommend vegetarian dog foods in general. Health Extension’s vegetarian entree is AAFCO-approved for growth and maintenance but if you check the nutrient percentages for the food you will see that they are not the same as the percentages for the brand’s other canned foods. If your dog can eat other foods that have meat protein, we recommend that you feed them. From everything we see here in the kibbles and canned foods, the Health Extension foods look very good. We’ll look more closely at one of the foods below in our review. 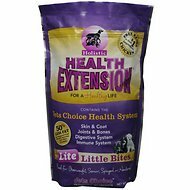 Health Extension Little Bites dog food is one of the company’s top selling foods on Chewy.com and other sites so we thought it would be a good food to review. 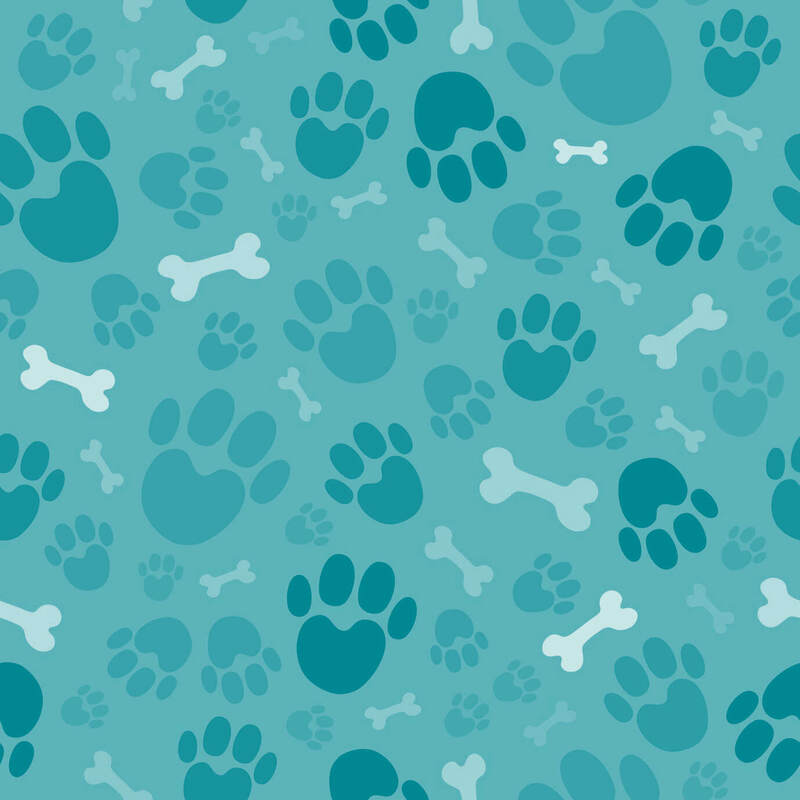 According to Health Extension, Little Bites has been specifically created for Toy and small breed puppies and dogs. As far as we can determine from the nutritional information on the web site, the ingredients and nutrient percentages for this food appear to be the same as Health Extension Original dog food but the food has smaller kibble pieces which make it easier for puppies and small dogs to eat. The food contains no by-products, no rendered animal fats, no corn, wheat, glutens, or soy; no artificial preservatives, added sugar, artificial flavors, colors, or dyes; and no BHT or ethoxyquin. It’s available in several bag sizes: 4 lbs, 10lbs, 18lbs, and 35lbs. The first five ingredients in this food are: Organic Deboned Chicken, Chicken Meal, Ground Brown Rice, Chicken Fat (preserved with Mixed Tocopherols and Ascorbic Acid), and Lamb Meal. 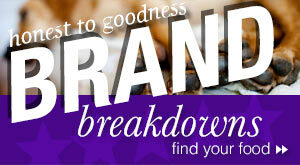 (Health Extension provides a nice Ingredient Index for customers to check on ingredients.) According to the company, their deboned chicken is the same chicken that people eat. Although they mention that it has no added growth hormones or steroids, poultry raised in the United States has not been raised with hormones since the 1950s so this is a little misleading – though many pet food companies and even companies that sell poultry for human consumption make this same claim. And steroids are a kind of hormone, so it’s not really necessary to repeat the term. Putting that issue aside, organic deboned chicken is a very nice ingredient. It’s a whole meat so it will contain more moisture than a meat meal. Once the moisture is removed, this ingredient might fall lower in the list. But the second ingredient in the food is chicken meal. This is a concentrated form of chicken that has had most of the moisture and fat removed. Chicken meal typically contains about 65 percent protein and 12 percent fat. Chicken is a good source of vitamin B6, niacin, and phosphorus. The third ingredient in the food is ground brown rice. Brown rice is considered to be slightly more nutritious than white rice. Brown rice has the inedible outer hull removed; white rice is the same grain with the hull, bran layer and cereal germ removed. Brown rice is rich in thiamine, calcium, magnesium, fiber, and potassium. It has anti-oxidants and fiber. It also releases sugar into the bloodstream slowly so your dog won’t experience spikes in his blood sugar levels. The fourth ingredient is chicken fat. While you might think twice before adding chicken fat to your own meals, chicken fat is a good ingredient in dog food. It’s a named fat so you know the source. It’s also an animal source of fat (as opposed to corn oil or vegetable oil which are plant sources of f which is good for dogs. And it’s high in linoleic acid, an omega-6 fatty acid which is considered to be good for a dog’s skin and coat. The fifth ingredient is lamb meal. It’s not unusual to find a second kind of meat protein in a dog food but you do need to be aware of its presence in case your dog has any difficulties with other proteins. Most dogs can eat lamb without any problems but it’s always a good idea to read the ingredients on the label just to make sure you and your dog won’t be surprised. Lamb and lamb meal are a good source of protein that most dogs enjoy. It’s flavorful and it has a different amino acid profile from chicken and some other common meat proteins. According to Health Extension, their lamb and lamb meal comes from free-range Australian and New Zealand lamb sources. It is hormone and antibiotic-free. Other ingredients of interest in the food include menhaden fish meal. Menhaden is a common fish off the coasts of the United States. It’s used as a source of fish oil and it’s a major source of omega-3 fatty acids for neutraceutical companies. Most people don’t eat them today (though Native Americans fished for them), but the meal is often used in dog foods. Menhaden fish meal is a good source of concentrated protein and fatty acids. The food also contains fish oil as a source of DHA. DHA is deocosahexaenoic acid – a fatty acid that is known for helping with brain development in puppies and perhaps playing other roles in intelligence. The food also has glucosamine and chondroitin which are known as supplements to help inflammation associated with arthritis and joint mobility. Dried beet pulp is a fiber and prebiotic. Brewers dried yeast is an excellent source of B vitamins and other vitamins and minerals. It should not be confused with Brewers rice. The food also contains lots of fermentation products, otherwise known as probiotics, which aid in digestion. The food uses polysaccharide complexes to provide minerals. These are synthesized ingredients that are supposed to improve the bioavailability of the minerals the same way chelated minerals do. The food also contains organic apple cider vinegar. This is an ancient antibacterial and anti-fungal that helps normalize the dog’s pH balance. It’s suppose to boost the immune system. Flaxseed is a source of omega-3 but it’s a plant source so dogs can’t utilize the omega-3 fatty acids to any great extent. However, flaxseed is a good source of dietary fiber and it provides antioxidants. It’s also a plant-based source of protein, with 12 percent protein, 66 percent fat, and 22 percent carbohydrates. It’s also a big source of omega-6 fatty acids. Finally, the food has barley malt in it. It’s high in vitamin B12 – an appetite stimulant. It’s also high in calcium. It’s not used in too many dog foods but it seems to be used as a flavor enhancer. Nutro also uses it. Overall, the ingredients in this food look very good and we don’t see anything to cause concern. The dry matter basis (DMB) figures for this food are: 26.7 percent protein; 20 percent fat; 4.4 percent fiber; and 40 percent carbohydrates.This food has average protein for a super premium dog food and slightly higher fat compared to many super premium dog foods. 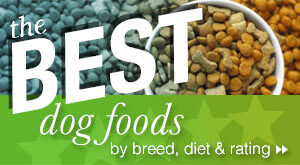 It has above average fiber and it is about average in terms of carbohydrates compared to many premium dog foods. Where can you buy Health Extension Dog Food? 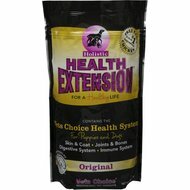 Health Extension pet foods are available online at Chewy.com and other online retailers. You can also find them at many local independent retailers by checking the Where To Buy feature on the Health Extension web site. You can visit Health Extension on Facebook to see where their representatives will be. They often have giveaways on their page. You can also sign up for Health Extension’s newsletter and discounts on their web site. From everything we’ve seen about the Health Extension foods, both kibble and cans, we like them very much. Many of the kibbles are grain free but you can also choose foods that contain some brown rice, pearled barley, or oatmeal if you prefer. The grain free kibbles use a variety of carbohydrates such as chickpeas, lentils, sweet potatoes, and potatoes. If you don’t like one ingredient, you can find a food that probably has an ingredient you will like. The foods also come in a good selection of meat proteins. The same is true with the canned foods. We also like the fact that there are few, if any, filler ingredients in the food, by anyone’s definition. None of the foods appear to have any ingredients to cause concern (unless you want to be super picky and worry about guar gum in canned foods – which we don’t). Highly recommended. 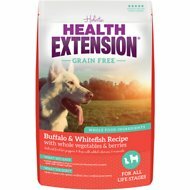 I tried this HE Grain Free Buffalo & Whitefish Formula when I was searching for a new food for our sensitive IBS prone Chow Chow and we’ve had great results with it since November. Since he’s been on his new kibble with a change to a novel protein – our boy has not had one bout of diarrhea, is full of energy and can eat any kind of snacks. He’s maintaining a healthy weight, eyes are bright and skin no longer has dandruff, has a great appetite, with very normal poops. He can enjoy treats without us fearing his tummy will hurt later and get runny stools. We do supplement his diet with different add-ins of coconut oil, sardines, low salt cottage cheese, butternut squash and sweet potatoes — but are so happy with this line of food as his base diet. 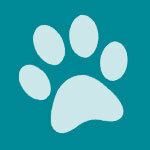 We’ll continue sampling their products with all of our 3 pups. They all love everything we have tried so far, and we feel good about feeding this to them. We have been using HE Grain Free Buffalo & Whitefish for our sensitive stomach Chow Chow for the past 7 months with great results. The rescue fostered him for over a year and told us he had a very “sensitive tummy” and he wasn’t allowed treats – when we got him home we found he could not any kibble or biscuits, without having diarrhea, terrible gas and constant need to go out. We slowly switched him over to HE, and he hasn’t had one day of bad tummy issues since then! He’s full of energy and can eat almost anything now, can enjoy treats just like our other 2 dogs. We are so happy to have found this brand and will continue using it. It is bit expensive, but we feel good about the ingredients and the track record of the company.